Hope you agree with me when I say that the world is moving fast towards the mobile-first technology? That together with other technology changes such as the much hyped mobile-first indexing by Google are changing the way we operate our lives. For some, we are already there. This notwithstanding, many of us cannot rule the need for the traditional computer technologies. That is why we have created a list of best laptop docking stations 2018. After researching and testing a majority of them, we have shortlisted the top 10 docking stations that you can buy. Well, you may ask what does a docking station do for a laptop. Ok, we’ve two types of laptop owners today: those that can work comfortably from the cloud systems thus no need for much storage space or irrelevant ports, and those that want to enjoy massive space and control from peripherals yet on a portable device. We all know what we want to work in a comfortable way. The question remains, how do you get the best laptop docking station in 2018? Well, we have delved into the market to give you a detailed understanding of the best docking stations, an update to our best laptop docking stations 2018. Each of the docking stations outlined below is designed to offer an expansion to the ultrabook performance thus better productivity. Using a dock makes it easy to use multiple monitors and other peripherals with your laptop. 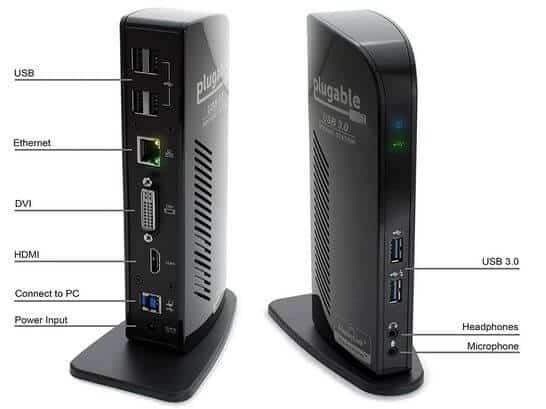 Plugable USB 3.0 Universal Laptop Docking Station for Windows is designed to support dual Full-HD screens. It has modern ports to ensure effective connectivity to your machine. While this device does not work with 4K monitors, it is effective for use in various settings. This is a small monolith that is made to stand on the desk. It is ready for connection various peripherals to the PC. Made with a black plastic and standing vertically, the dock has a sturdy base and screwed into the bottom. The 7-inch tall dock comes with various essential ports. It allows for easy connection to your laptop and other external devices. Connecting to multiple monitors was interesting during our review. I found the VI and HDMI ports very useful. The dock has USB 2.0 ports and an Ethernet jack. To connect your laptop to the dock, there is a USB-Type B port. On the front, there are two USB 3.0 ports. These are super-speed ports for ultimate data transfer. The face comes with a microphone and headphone jacks. For the old VGA-only monitors, the dock comes with a DVI-to-VGA adapter. Worth mentioning is the need to use an HDMI-to-DVI adapter if your monitor lacks an HDMI port. SuperSpeed USB 3.0 for up to 5 Gbps link between a laptop and audio, video, network and extra USB 3.0 ports. Backward compatibility to allow connection to USB 2.0 devices. Compatible with Windows 10, 8, 7 and XP. It works with Intel and AMD-powered devices only. Sufficient display ports including HDMI and VGA/DVI for use with external monitors. 4 USB 2.0 ports controlled by Terminus chipset, and USB 3.0 ports. Four-Amp AC power adapter, USB Type-A male and USB Type-B male cable. DVI-to-VGA passive port adapter. During the external monitors’ performance test, I connected the Dell Inspiron 17 5000 laptops to the Plugable USB 3.0 Universal Laptop Docking Station for Windows. The machine has an Intel Core i3-50110U processor, 4GB RAM, and a 500GB hard drive. This means the computer is not expensive. When testing from an HDMI port, the resolution was maxed at 2560 x 1440. The dock enhances video quality to deliver even a 4K video without lags. It can allow for 1080p streaming smoothly. Overall, for your Windows PC, the Plugable USB 3.0 Universal Laptop Docking Station for Windows is all you need to achieve the ultimate performance level. It is affordable and delivers immensely. Our review team reviewed it as a powerful dock even after throwing a lot to it. The device expands the laptop performance to deliver beyond the ordinary. Modern laptops, tablets, and ultrabooks have gone slim, but at the expense of a few important ports. This has hampered the ability to connect to peripherals and other accessories. 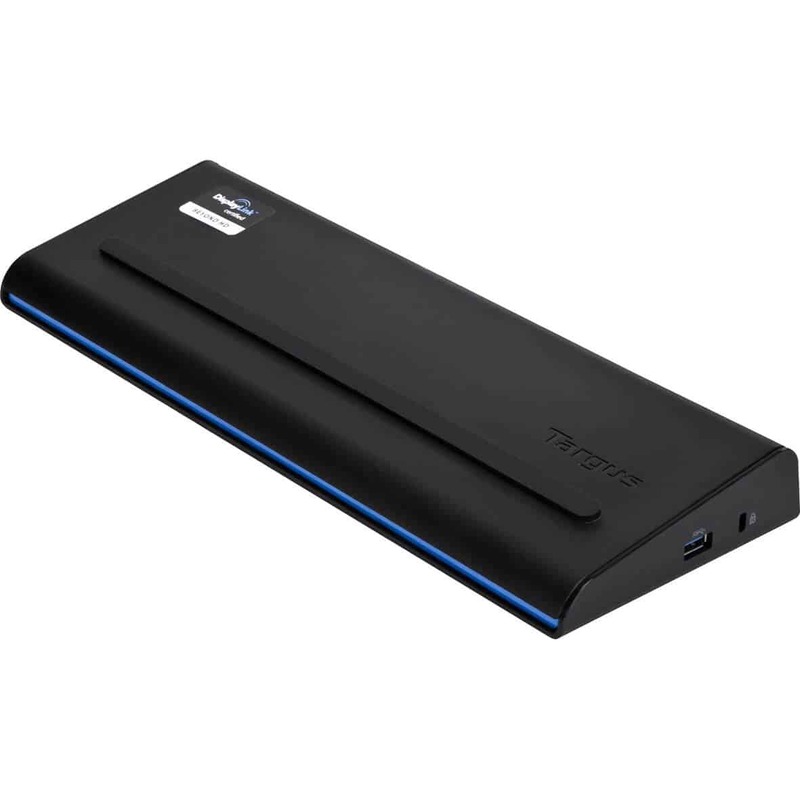 If you love connecting your portable device to external monitors, keyboard, mouse among other peripherals, you need a quality docking station. Getting the outright docking station could be tricky. The new Anker Dual Display Universal Docking Station offers you an obvious choice. If you want to take control of your workspace, this is the best station for coordination. Built for simplicity, this docking station gives you the ability to connect all your peripherals through a single USB 3.0 cable. Thanks to the DVI and HDMI dual connection, you can connect to two external monitors to give you a total of 3 display units. This is a great working experience at home or office. The Anker Dual Display Universal Docking Station works comfortably with Android, Ubuntu, Mac and Windows (10, 8, 8.1, 7 and XP). This is one of the most reliable, and favorite universal docking station in the market. I found the station to offer optimal use with every laptop I had. Worth mentioning, for Linux and Mac users, ensure that you have the correct software. The station comes with ‘Automatic Bandwidth Prioritization.’ This is a built-in feature that keeps on working to ensure the constant and smooth running of the system. It ensures no breakdowns and lags during your work. Transfer of data can be the best at 5 Gbps thanks to the dual USB 3.0 ports. They allow connection to high-speed devices at a go. The ports are found on the front panel. The back panel comes with 4 additional USB ports, USB 2.0 ports for extra connection to your system. In additional super speeds on the USB 3.0 ports, one of the two USB 3.0 ports can allow for charging. I must admit that this is a feature out of the ordinary. Most docking stations do not have this feature. The mother of all hubs helps you to work at the helm: Bring that printer, scanner, external HDD, speakers, monitors, keyboards, mice, webcams, and routers together, and there is no worry for multiple cables. You can utterly turn your laptop into a command center. Multitasking is a dream-come-true: You can add up to 2 more monitors thus expanding your control on the active applications. I enjoyed this feature so much thanks to the Anker Dual Display Universal Docking Station. You can use the high-resolution displays through DVI and HDMI so as to surf the web, stream videos and manage your business operation at one go. Incredibly dynamic design: The docking station consolidates all your peripheral devices for better management. Also comes with a chip for prioritization when running at a full capacity. The base stand is made of zinc-alloy, a sturdy one to remain stable when in operation. Transform your Surface into a desktop PC by using a Dock now for the ultimate performance results. It comes with an array of useful ports that are needed to deliver High-Definition video. There is a Gigabit Ethernet port for quality connectivity and to ensure that you remain online. There are 4 USB 3.0 ports that allow super-speed data transfer to and from the laptop. Your dock has an audio output thus making this an all-around docking station you are looking for in the market. Get it right at work. Using a Microsoft Surface Dock transforms your ultraportable Surface into an immensely powerful desktop PC. If you have been using Surface Pro 3, then the current docking station is nothing new to you. The unit comes with a full base making it easy to slip the Surface Pro 3 into the protective dock. There is an Ethernet port on the back. A Mini DisplayPort and 5 USB ports ( 2 USB 2.0 and 3 USB 3.0 ports). The new Microsoft Surface Dock is compatible for use with Surface Pro 3, Surface Pro 4, and Surface Book laptop. There is a magnetic connector to the external devices. Designed with class, it sits unobtrusively behind your laptop. This creates a decent look on your desk. Both the current and previous Surface Pro tablets are easily supported. Measuring 5.12 by 2.36 by 1.18 inches, the Microsoft Surface Dock weighs barely 1.21 lbs. The port selection from this docking station is incredible. Compared to its predecessor, the new dock comes with a great choice for quality connection ports. There is even great news thanks to the dock’s capacity to drive 4K-resolution displays. Transfer of data on this dock is super-speed. All the USB ports are USB 3.0 making the device very effective. Use a single Surface Connect cable to pass all the signals between the dock and the tablet. Naturally, there is a need to supply the dock with its power. Charging your Surface Pro should not be an issue since it can charge while connected. 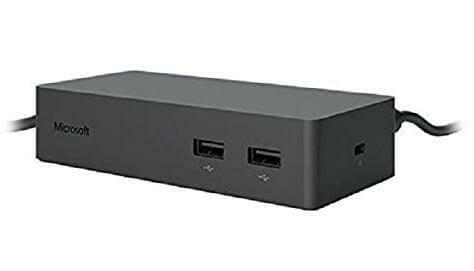 The new Microsoft Surface Dock comes in a sleek, compact look as opposed the previous design. 4 USB 3.0 ports: For super-speed transfer of data from the laptop. The ports are used for connection to all other peripherals. Gigabit Ethernet port: To offer speedy LAN connection thus effective surfing and always staying online. SurfaceConnect Technology: This is a state-of-the-art transfer technology that allows for charging and simple connectivity through a single cable. Audio-out and 2 Mini DisplayPort input ports: You can only enjoy the of your laptop’s entertainment capacity with the new dock station. As you would expect, the Microsoft Surface Dock comes with an easy guide on how to use it. It is a reliable solution for maximum performance results for your ultrabook. Always utilize the dock for ultimate results, and you will enjoy working from home and the office on multiple applications at one go. The fourth laptop docking station in our list is all the way from Apple. We all agree that laptops are best known for their portability. This is the distinguishing factor from the normal desktop computers. All said and done; this dock allows you to connect all devices you have to your MacBook at once . Modern manufacturers have created ultra-slim laptops and to achieve a powerful workstation has become so difficult unless you have a reliable docking station. More often, we have found ourselves struggling to fix a new device into our laptops. You do not have to go through this experience. Get Elgato Thunderbolt 2 Laptop Dock with Thunderbolt Cable and enjoy an elevated laptop into a modern desktop workstation. Plugging and unplugging devices to and from your laptop could be hectic. Apple thought through this and created a premium, super powerful speed connector for their users. The connectors are designed to offer necessary speed and bandwidth for huge and fast hard drives. The connectors support external graphic cards and high-resolution monitors. 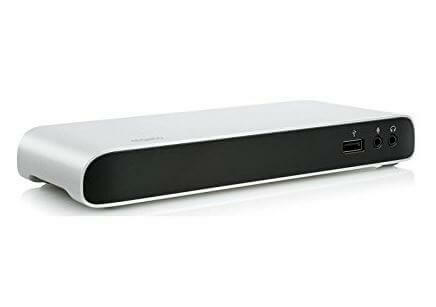 Elgato Thunderbolt 2 Laptop Dock with Thunderbolt Cable comes with a built-in HDMI port that can work with any display. If you need to keep up with your professional standards, color reproduction and non-glare issues will not be a problem. The docking station can deal with reflections in the office and manage your huge screen. You will be thrilled to learn that your laptop can now handle up to 4k resolution displays. It does not matter the number of devices you need to connect, all you need is the powerful Elgato Thunderbolt 2 Laptop Dock. It comes with additional 3 SuperSpeed USB 3.0 USB ports to ensure that all your devices are connected. The docking station is created to take up as little space as possible. The workspace is always neat and organized. To be on the safe side, ensure that you have a backup drive in case you decided to pull out the devices unexpectedly. Due to computer limitations, you cannot keep on plugging devices in and out. There is a USB port found on the front face of the Elgato Thunderbolt 2. This makes it easy to access and to plug in devices becomes faster. 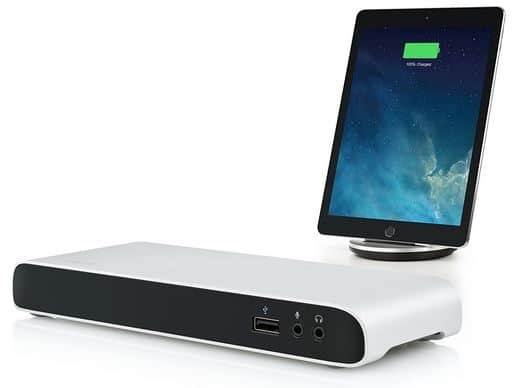 Charging your iPad or iPhone is just easy with the Elgato Thunderbolt 2 Laptop Dock. The docking station is made out of the ordinary. Unlike the traditional USB hubs, this dock station provides sufficient power to boost your mobile devices’ charge. You can connect additional bus-powered devices to the Apple keyboard or even use your Apple SuperDrive. Even better, you can charge your devices when the computer is turned off, thanks to the docking station. Sound and network connectivity is made even better with this Laptop Dock. It allows for amplified stereo audio port. There is an extra input port to allow for concurrent high-quality microphone connection thus quality conference calls. Stay online with great internet connectivity on the Elgato Thunderbolt 2 Dock. It comes with a Gigabit Ethernet port to ensure high-speed connectivity. Your download and web surfing is simply out of this world. File transfers are also reliable on this port without any additional adapters. To enable the high-power USB support for Mac, download the free Elgato Thunderbolt Dock Utility and install it. HDMI port for directly connecting a display. Comes with only three USB 3.0 ports. It does not matter the laptop you are using: Mac, Windows PC, or Chrome, the Targus USB 3.0 SuperSpeed Dual Video Docking Station is the ultimate solution to your laptop transition. It is designed to convert your machine into a portable yet highly productive workstation. With a single, simple USB cable, you can be sure to connect your devices for expansion and immense performance. You o not have to worry about your many peripheral devices anymore. This dock will transform the ultrabook into a powerful desktop PC. Connectivity on this universal dock allows for instant access to your devices and accessories thus empowering productivity. From the full-size keyboard to the mouse, external hard drives, and Gigabit Ethernet, the docking station will deliver without a failure. If you are looking into transforming your laptop into a perfect workspace, this is the chance you have been waiting for. This is an out-of-the-box solution offers all you need to get and make your system start working in minutes. It comes with power adapters that are compatible with most PCs. Dock to multiple monitors and peripherals with just a single cable connection. Integrated power supply of up to 90W. It comes with power adapters for most PCs. Gigabit Ethernet port for fast and secure internet. Supports 2 additional monitors of up to 2048 x 1152K resolution. Wedge design to save on space and elevating laptop for easy cooling. Slim laptops are designed for convenience. If you are looking to get the best out of your ultrabook, it is important that you consider improving on connectivity. Most of the modern day laptops have a shortage in ports. When working from a desk, it becomes difficult to use other peripherals. To use Targus, you need a laptop with a USB 3.0 port. The Targus USB 3.0 SuperSpeed Dual Video Docking Station comes with power plugs and gives the option to connect to two additional monitors and other peripherals. Made with a black plastic box, the 1.25x13x4.75-inch device comes with a handy tray under the lid. It is a 7-letter coded power tip, or every plug ends with a power cable. The USB 3.0 cables that are used for power supply are about two feet long each. This means everything stays close to your laptop. There is a DVI-I to VGA adapter as well as an HDMI to DVI-D adapter in case the standard DVI-I and HDMI ports do not work with your monitors. Unfortunately, there is no DisplayPort port. The bottom line is: once the setup has been done correctly, the Targus USB 3.0 SuperSpeed Dual Video Docking Station is the ultimate solution for the expansion of your ultrabook and all your laptop connectivity. This will bring about the best from your computer. Nothing comes through for your workstation like having multiple display units for the different projects you could be handling. The Kensington SD3500v Universal USB 3.0 Dual Display Docking Station comes with the best expansion capacity to make your laptop a powerful device to deliver adequately. Let’s face it; today every manufacturer is fighting to go ultra-thin on their notebooks. This has become the trend with a lot of sacrifices on some of the features including ports and storage space among others. Thanks to the docking station technology, you can enjoy expansive connectivity and display all in one. The docking station comes with modern USB 3.0 ports for super-speed data transfer. You can now copy stuff to and from your laptop at a speed of up to 5 Gbps. The ports have a reliable backward compatibility technology to accommodate USB 2.0. This dual docking station brings forth an immense productivity boost without sacrificing on aesthetics or taking up much desk space. Featuring a slim design, the docking station complements the modern Ultrabooks in a perfect manner. You can use the Kensington to lock down the station for maximum security. This universal docking station is created to work with your ultrabooks including MacBook machines and other super slim laptops by converting them into a powerful workstation without much of an effort. You can have multiple monitors while working on our project. With Kensington SD3500v Universal USB 3.0 Dual Display Docking Station, it is as simple as connecting to a single cable. It comes with a DVI port to allow for connection to the DVI monitor. There is a DVI>VGA adapter that allows for connection to VGA monitor too. In case you have an HDMI monitor, there is an HMDI out port that you can connect to and display to a large screen. I enjoyed connecting to a second HDMI monitor to the DVI port through and include DVI>HDMI adapter. With this docking station, it is possible to run both DVI and HDMI ports at one go. Make your workspace even bigger. 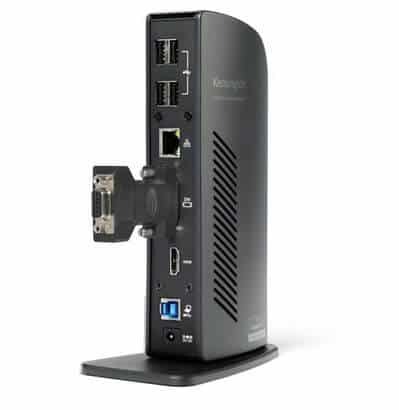 The Kensington SD3500v Universal USB 3.0 Dual Display Docking Station comes with an ‘Extend Mode.’ It allows for sharing of the desktop across multiple screens. This is a feature I found to be interesting for improved productivity when working with and viewing multiple applications at the same time. Heard of cloning? Well, with Kensington SD3500v Universal USB 3.0 Dual Display Docking Station, it is possible to replicate the content from one monitor to a second display. This works best for presentations and team projects. You can continue to work on the master display as the content is projected on the other monitor. The docking station comes with an intuitive display management console. It sits on the laptop’s applications bar. With this, you can switch between various display modes, change the master and slave monitors, or adjust the alignment as you position the screens. For corporate, there is an installation support for mass installation through Microsoft Server. The Kensington SD3500v Universal USB 3.0 dual display docking station features a modern design with ports well positioned to ensure maximum productivity. You do not have to worry about making your laptop come through during mass production and presentation anymore – get your docking station now. HP Compaq Ultra-Slim Docking Station is designed for the ultraslim HP EliteBook Notebooks, exclusively. The docking system helps in expanding the display, connectivity features, and network capacity. This is an advanced way to enhance productivity at work. With a simple slide-in, one-click dock, you can enjoy the coolest ultrabook expansion system. Featuring four USB 3.0 ports for optimal speed connectivity, this dock station comes with an expansive connectivity to all your USB devices. Data transmission over the new USB 3.0 technology is super-speed as compared to the traditional USB 2.0 ports. The ports have backward compatibility with the USB 2.0 devices and are bi-directional. The display can never get any better. With the VGA and DisplayPort ports, the dock station will ensure that you get future and legacy compatibility for your choice of video devices. The HP Compaq Ultra-Slim Docking Station comes with a high-speed Ethernet/LAN port to ensure that you stay online. When working from outside the office, your HP laptop can be of ease to carry around. If you need to expand the performance and productivity, you can now use your docking station to enjoy a feel like none other. With a single cable connection to your laptop, you can sit back and enjoy full-space expansion and connectivity to all your devices. Everyone wants to have the convenience and capacity to work from any place at full capacity. The HP docking station converts your portable device into a powerhouse with fully-fledged working capacity. All you need is to connect to the right devices and enjoy. Working on multiple projects and need to highlight results from various programs? Worry no more. The docking station is what you need. With multiple display connectivity, you can enjoy 3 display units at one go without a problem. The dock station works efficiently in displaying different tasks on the 3 monitors making your notebook appear a modern powerhouse workstation. During our review, I experienced the difference that comes with the use of a docking station. It made you feel a whole new way from the typical laptop use. It turns your computer into a workstation beyond what you can ever imagine. It is a superb technology that you need for better results while using your HP laptop. Charge your smartphone without hustling for a socket to plug in thanks to the charging USB port on the dock station. Powering your laptop is even fun and simple on this station. In a nutshell, the station makes everything work easily and with less involvement. This universal USB docking system is made to deliver top-notch experience while working with your laptop. The dock can support up to 2K and 4K resolution displays thus delivering state-of-the-art displays. Connecting to external devices could prove to be daunting for your laptop. However, I could not imagine the beauty of doing so on a docking station. You can easily connect to all your peripherals for ease of use. With a single USB cable connected to your Lenovo PC, you can immediately access external USB ports, monitors, and keyboards as well as Gigabit Ethernet port and printers among other devices that you use on a daily basis. Charge your mobile devices like the smartphone while using the dock thanks to the duo USB always power on ports. It requires AC power to operate. Laptop Docking Station Lenovo Thinkpad USB 3.0 laptop dock supports videos that have a frame rate lower or equal to 24 fps. This consumes much of the laptop resources if played on an external monitor at 30Hz (3840×2160 pixels). For quality video playback, the user guide has outlined the right settings. Many are the times we walk into a meeting carrying a light notebook. It is convenient, and everyone wants that. However, we need to show our presentations in and right after that, head into our offices for the day’s job. This calls for maximum productivity. It is not easy using your laptop for such tasks. To ensure maximum productivity, always have various peripheral devices connected. It is not easy and thus the need for a docking station. With one cable, you can sync all your devices to your Lenovo notebook. It is the simplest way to maximize performance yet minimize space usage. Having more than 4 USB 3.0 ports makes it easy for you to transfer data to and from your computer. It’s a fast technology suitable for huge data transfer. Connectivity to the internet is made even more reliable when using the dock. It comes with a super-speed Gigabit LAN port for reliable connectivity. You can even share files comfortably with peers. How many ports do your Lenovo machines have? Today, most ultrabooks have shelved the storage spaces and ports to deliver a thin device. It has worked for portability. Truth be said, most of these devices cannot perform as their desktop counterparts due to the peripheral device limitations. 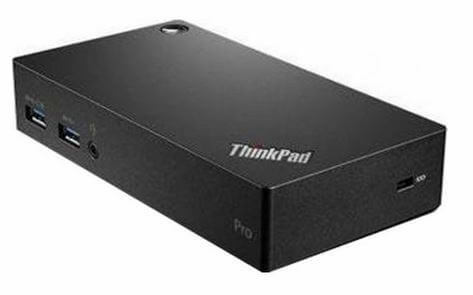 When you get a Laptop Docking Station Lenovo Thinkpad USB 3.0 Ultra Dock-US 40A80045US, you can rest assured of incredible results from your laptop. If you like organizing your work in the office, space is always a very important aspect. Thanks to the docking station, you can utilize as little space as possible while maximizing your productivity on the laptop. Nothing brings better results than having access to multiple applications at the same time. This is only possible if you can display from multiple monitors at one go. Bring all your external devices, plug them in and expand your notebook’s possibilities. With over 12 ports for quality connectivity, you cannot go wrong with the new OWC Thunderbolt 2 Dock with 1M Thunderbolt Cable. The dock supports up to 4K Ultra-HD, multiple display units. There are 5 fully-powered USB 3.0 ports that allow for high-speed data transfer. Among them, there are two high-power ports for mobile device charging. Connecting your external devices and storage should not be an issue thanks to the FireWire 800. It can only be possible to get the best out of your Mac laptop if you configure any external devices correctly. Apparently, plugging in and out the many devices could mean a difficulty. With the Thunderbolt Dock, you can rest assured of super quality performance. Convert your office laptop into a perfect workspace with a single Thunderbolt 2 cable. The OWC Thunderbolt 2 Dock is all you need to achieve the perfect performance that compliments the incredible performance. You can now connect up to 5 super-speed USB 3.0 devices, FireWire device, HDMI, Gigabit Ethernet, and audio-in and audio-out. Get an astounding 20 Gbps throughout the transfer when you use the incredible OWC Thunderbolt 2 Dock. It utilizes the bandwidth to ensure efficient data transfer without any bottlenecks. It is a simple connection to over 10 devices while daisy-chaining 5 more Thunderbolt devices. Your laptop can offer more than you think. With OWC Thunderbolt 2 Dock with 1M Thunderbolt Cable, you can maximize on the input devices as well as output devices. Thanks to the enough number of connectivity ports, the dock can power hard drives, SSDs, high-powered ports for even up to 1.5 Amps of power, and connect optical drives like the two side-mounted. Make the best out of your laptop now thanks to the docking capacity. 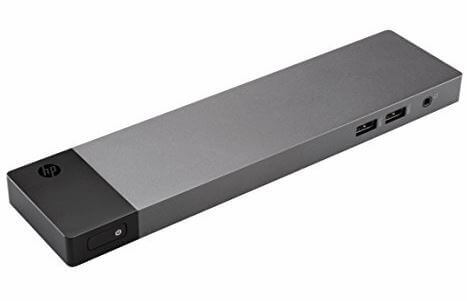 The OWC Thunderbolt 2 Dock provides unrivaled expansion of your Thunderbolt-equipped Mac laptop to deliver peculiar connectivity and dependable performance. Connecting to multiple displays is a great way to achieve more power. Setting up this would normally be hectic and needless to say, time-consuming. To meet your workflow needs, consider using an exceptionally effective 4K Ultra-HD monitor. You can use 2 HD displays or one HD and one 4K UHD displays. This is the immense power than the docking station offers you. You can even use a VGA, DVI or a DisplayPort monitor for a dazzling display of might thanks to the OWC Thunderbolt 2 Dock with 1M Thunderbolt Cable. The docking station offers unmatched performance enhancement for your notebook. It is the illumination of the new era of flexibility and connectivity that deliver remarkably performing workstations. The backward compatibility with the existing hardware is a plus for those intending to use USB 3.0 on an older Mac. You can be sure to enjoy a smooth performance even on your previous device without having to compromise on anything. The HP ZBook 150W TB3 Dock is designed to offer a creative and expansive yet a streamlined and powerful workstation. The expansive device offers brilliant networking and great display as well as charging through a simple dock cable. Are you an HP ZBook user and want to extend your ultrabook workspace? Worry no more. The HP ZBook 150W Thunderbolt 3 Dock is all you need. The docking station provides connection to your ZBook laptop thanks to the additional ports. The Thunderbolt-equipped docking station for HP notebooks allows for connection to extra storage external drives, monitors, and printers. The dock comes with four USB 3.0 ports. One of these ports allows for charging devices that are battery-powered. You do not have to worry about your smartphone going off due to lack of charge anymore. There is a super powerful Gigabit Ethernet port that is onboard. This allows for convenient network access. You cannot get enough of this docking station. With one VGA port, two DisplayPort 1.2 ports, and one Thunderbolt 3 output, video entertainment goes to another level. The audio system comes with the audio jack combo. This makes it a holistic system for your extensive use. Worth mentioning, the HP ZBook 150W TB3 Dock comes with a surge-protected AC adapter. Get the top-of-its-class bandwidth thanks to the powerful Thunderbolt 3 port. This delivers up to 40 Gb/s. 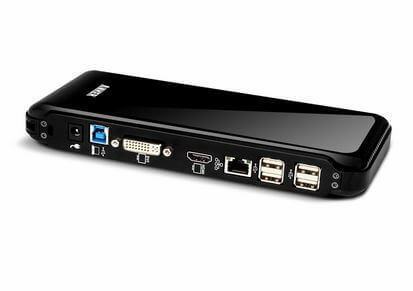 The dock can support DisplayPort 1.2 and the modern USB 3.1 technologies. You can connect up to 10 devices at one go thanks to the Thunderbolt 3 connection. Isn’t this futuristic? Additionally, the dock comes with a reversible USB Type-C interface to provide an external device charging for up to 15 watts. This is more than just a computer workstation, right? Charge and Connect: You can easily replenish your HP ZBook power with a robust charging system through the docking station. There is a modern power passage directly through the Thunderbolt 3 power cable to the notebook making it is a convenient way to charge and connect without a hassle. Mobile Workstation: It is true to say that the Docking Station provides efficient connectivity to the various devices at your disposal. The immense connection capacity through the Thunderbolt 3 allows for multiple connections at once. It is true to say that the dock converts your ultrabook into a ‘Compact Office On-the-Go.’ You can simply slip the dock into your bag and enjoy convenient charging, networking, and expansion with a single cable. Finally, this is probably one of the best laptop docking station from HP, with it you can be sure to convert your ultrabook into a more comfortable working station. The dock is made for convenience and offers ultimate class and choices. You can now expand your system for better performance without any compromises. Docking stations are designed to convert laptops into more reliable desktop replacements. With the modern laptops going smaller thanks to the dearth of ports and storage space, these stations have been known to work best in making ultrabooks more comfortable and powerful from wherever you are. They simply turn a laptop into an easy-to-use desktop. It is true to say that mobile devices are very convenient to use. However, to get most of your work done, there is always need for a computer. This is the scope even for laptops. They are convenient for use, but desktop PCs are the outright choice for office domain. This is no longer a cause for worry. With docking stations, you can be sure to enjoy the best of both worlds. You can simply chuck your laptop while in meetings and later dock it into a regular desktop and connect to a monitor or keyboard while in the office or at home.